Charter Oak by Foundation - Buy Premium Cigars Online From 2 Guys Cigars . 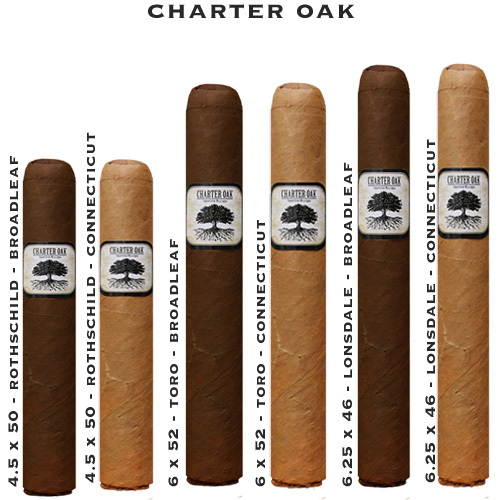 In naming the cigar, Melillo chose a a name that represents the greatest symbol of his home state Connecticut, the Charter Oak. Historians estimate that this unusually large Oak tree began growing sometime during the 12th century on a plot located on what is now downtown Hartford. Native Americans, who by the way cultivated tobacco nearby long before settlers, held councils beneath its massive branches. The tree is actually mentioned in Dutch Explorer, Adrian Block’s journey guidebook in 1608. By the mid 1600’s the plot was parceled and a farm was built with the agreement that the local tribe could share this sacred tree. In 1662 King Charles II issued a Royal Charter to the Connecticut Colony granting an unusual degree of autonomy. However, when his successor, James II appointed an English Governor-General to reclaim the Charter, it was hidden in what became known as Charter Oak, one of our countries greatest symbols of American Independence.